Two warders of the Nigerian Prisons Service, Delta State Command, are currently wallowing in regret as they have learnt a little too late that those who consort with criminals usually pay a high price. The warders, DCIP Anthony Nketan, 55, and SPA Justice Oveto, 34, are currently facing prospects of serving time in prison if found guilty of the role they played in providing easy access for an inmate in the prison who reportedly went out on three occasions to hold meetings in a hotel room with members of his kidnap gang who thereafter went about wreaking havoc across Delta State. Unfortunately for the warders, the bubble burst on their illicit activity as police detectives who had been on the trail of the gang caught them red-handed at the scene of the meeting. The inmate, Stanley Erujere, 32, currently serving 21 years jail term in Okere Prisons, Warri, was arrested by police officers inside Omaks Hotel, situated at No. 40 Ginuwa road, Warri. With him was Oveto, the warder who escorted him from the prison to the hotel. The pair later indicted DCIP Nketan, as the man who provided them with the pass that facilitated their exit from the prison. Other infernal facts came to light. Erujere had been using his phone to make calls inside the prison yard to call and rally his gang members to plan series of kidnappings. With easy passage from his confinement facilitated by the wardens, he had been able to meet members of his gang to plan and execute kidnap operations. Each time Erujere went out, to the hotel and back to the prison yard, he rewarded Nketan and Oveto with N3,000 and N2,000 respectively. 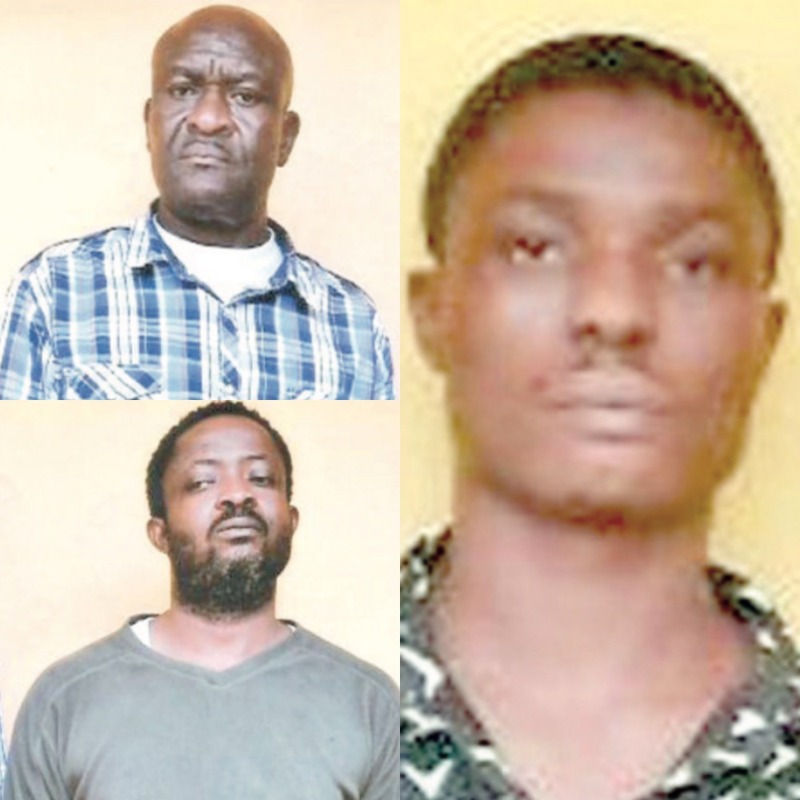 The kingpin had gone out of the prison yard three times to hold meetings with his gang at the hotel which culminated into three kidnappings in Warri and Asaba respectively before detectives busted the gang on June 22, 2018. The indicted warder, SPA. Justice Oveto, a native of Ughelli North Local Government Area of Delta State, enlisted in the Nigeria Prisons Service and trained in Owerri, Imo State in 2010 before he was posted to Okere Prisons, Warri, Delta State. He told Saturday Sun: “Since June 25, 2018, myself and one of the inmates, Stanley Erujere had been going out of the prison yard in Warri together to Omaks Hotel, Warri. It was my boss. DCIP. Anthony A. Nketan who gave me pass permit and ordered me to follow the inmate to the hotel. “We had gone out of the prison yard three times. It was on the third occasion that detectives arrested us at the hotel. DCIP Anthony Nketan, on the other hand, tried to wash himself clean of the accusations. The 55-year-old who hails from Ika South Local Government Area of Delta State told Saturday Sun he had no idea about what was going on. Delta State Commissioner of Police Muhammed Mustafa confirmed to Saturday Sun that detectives succeeded in arresting five men suspected of being members of a kidnap gang that had terrorized Asaba, Ughelli and Warri. Two kingpins of the gang are still at large, he affirmed. The police boss also reeled out some of the past crimes allegedly perpetrated by the suspects. On April 22, 2018, the gang allegedly attacked and kidnapped one Ejiroghene Omu at Jakpa road, Warri. From him they collected a ransom of two and a half million naira. They also robbed him of his Toyota Highlander jeep. On April 30, the gang kidnapped Maureen Anigbogu, 43. She was robbed of her Toyota Lexus Rx350 jeep at Beach Garden Estate, Asaba. They collected a ransom of two million naira. The same gang on May 22, using the first victim’s Toyota Highlander, kidnapped Benedicta Okeme Eseoghene, wife of Mike Okeme, former chairman, Nigeria Labour Congress (NLC), Delta State chapter, at Ogbueke Square, Asaba. The gang took a ransom of ten million naira. Five of the suspects are in police custody and allegedly have made confessions that have been helpful to police investigations. Stanley Erujere, the inmate who sneaked out of the prison to hold meetings in a hotel room, is one of the suspects. One of the suspects, Ikoyo Iroro, a.k.a. “Papuski’’, from Orerokpe Local Government Area of Delta State, claimed to have aided and abetted the escape of Walter, the leader of the gang when he was nearly apprehended by police on May 21. “I gave him my clothes, took him away through the toilet window and he boarded a motorcycle and escaped,” he confessed. Israel Jobome, 35, is the native doctor of the kidnap gang. The suspect, a native of Udu Local Government Area of Delta State, told Saturday Sun the extent of his involvement with the gang. “I used to sell bullets and cartridges to the gang leaders Walter and “Australia”. I sold it to them at N300 each. I gave them carton of bullets and cartridges during the Ijaw-Aladja crisis,” he said. Saturday Sun reporter was present at the Magistrate Court in Asaba on August 24, 2018, when the six suspects were arraigned at Magistrate Court 1 on thirteen (13) count charges of conspiracy, kidnapping, armed robbery, aiding and abetting and official corruption. They were arraigned before Chief Magistrate A. Dike who remanded the six accused to Ogwashi-Uku Prison and the case, adjourned till September 5, 2018.